Microsoft has added latest security features to Windows to develop a more user friendly platform. UAC (User Access Control) is one of the default feature of Windows 8 and 10. This feature prevents dangerous actions which can be performed by a malware/adware. UAC is the reason why we face warning alerts while making changes at administrative level. Sometimes you might face “You do not have sufficient access to uninstall this program. Please contact your system administrator” error while uninstalling a particular software. 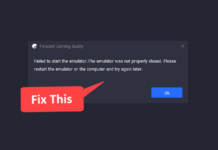 Most people face this error while uninstalling uTorrent program. 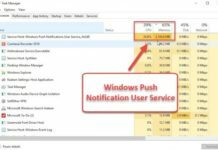 Here are some methods to fix “You do not have sufficient access to uninstall the program” error. Go to your C drive or the drive where you have installed Windows. Next open Program files and find the program you want to uninstall. If you are not able to find it then search for the program directory in start menu, right click it and select open file location. Now find the uninstall.exe file and run it with administrative rights. If this doesn’t works or you are not able to find the file then try the below methods. Press Windows + R to open the run window. In the run window type regedit and press enter. In registry editor go to HKEY_LOCAL_MACHINE\SOFTWARE\Microsoft\Windows\CurrentVersion\Uninstall. Here you can find bunch of random strings. Look for the program you want to uninstall. After you found the program look on its right hand side of the registry panel. Double click on UninstallString and copy its value data. Next, open command prompt with administrative rights. Search for cmd in start menu, right click it and select run as administrator. 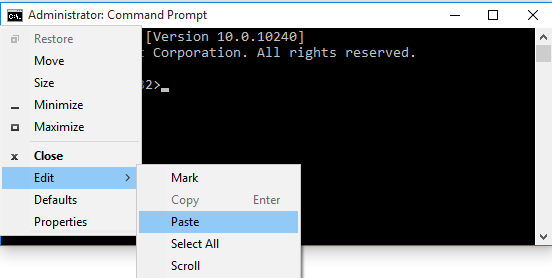 In command prompt, click on the cmd icon, select edit and further select paste. 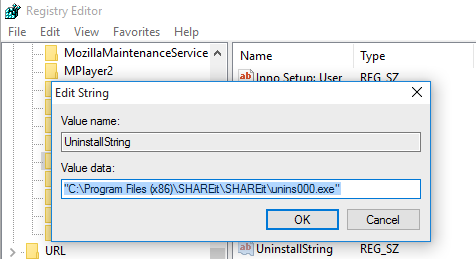 This should paste the value data in command prompt, Press enter and now you should be able to uninstall the program. If you found the above method complicated or don’t want to play with Windows Registry then you can uninstall the program using some uninstaller tool. IObit uninstaller works great and it also cleans the leftover junk files of the uninstalled program. Download IObit uninstaller and install it on your PC. Once it’s installed, launch it and find the program you want to uninstall. Select the program and click on Uninstall. You can also create a restore point before uninstalling the program. After the program in uninstalled click on Powerful Scan to scan for left over registry entries and junk files. Now you can select all the leftover files and delete them.